Hardcover, 88 pages, 15.5 x 21.0 cm, 6.1 x 8.3 in. One night, something wondrous happens in old Gepetto's workshop: the wood carver makes a doll and calls it Pinocchio. No sooner has he finished it than the wooden puppet comes to life – and disappears out through the front door. 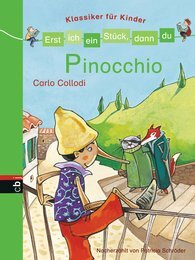 Here there are all sorts of adventures lying in store for Pinocchio. But if his biggest dream is to come true and he is to become a real boy, he has to rise above himself. Even after 130 years, Pinocchio's adventures have lost none of their charm. Delightfully told by Patricia Schröder. "This book is excellent for reading with beginners."